I’ve been around countless Christians my whole life, when I was younger there were a few that I found a little annoying. Funnily it wasn’t the ones who pointed out my faults, it wasn’t the ones who shoved the bible in my face, I could handle those people by laughing or walking off. No, the ones that really annoyed me were the impossibly calm and kind ones. They glided around as if everything was perfect in their lives. They were always smiling, kindness and peace endlessly shone out of them. I remember sniggering at how boring it must be to make so much effort to be good all the time. They were nice, too nice, but I didn’t want to be around them, I lived my life at the other extreme of their lifestyle. “As a mother comforts her child, so will I comfort you” Isaiah 66:13. Those words shot through my soul like a lightening strike. Freaked out I slammed that bible shut and didn’t go near another one for over two years! Because of my upbringing and because I believed in God I always labelled my self as a Christian. What I now know is I was a big hypocrite; I knew of Jesus but I didn’t know Jesus and had no desire to know him. I had long outgrown the sweet childhood stories I heard about him. In my twenties I was at a point in my life where I hadn’t made any plans. As I had time to reflect I felt really tired, not physically but internally. There was a strange empty longing in my heart. I didn’t understand it because there was no obvious reason. I turned to the self help section at a book shop but was overwhelmed by the titles and every book became relevant as I’d experienced a lot of hurt in my life, but this emptiness was more than that, I went home empty handed. Soon after that, I was alone in my bedroom and all the feelings imploded, I was done, broken I fell to my knees and I made a pretty scary decision, I cried out to God “I am ready for you to take the lead in my life”. I was a mess and I felt so sorry. Instantly I felt an enormous burden release from my body. A huge weight that I wasn’t even aware that I was carrying lifted off me! Then love came flooding into my heart. Beautiful, powerful, pure love. Wow. The ache in my heart disappeared. It has never come back. At the time I didn’t realise the small changes that started taking place but looking back now I see my faith started to grow, I also started losing the thirsts for once strong and embedded desires – things that I’d depended on for happiness no longer had a hold on me. I even had the urge to read the “dusty old boring impossible to read” bible, it suddenly felt comforting to me. I didn’t understand most of it but I found hope in Jeremiah 29.11 and although I didn’t know the deeper meaning at the time, I trusted the promise of it. Soon there came a major turn around in my life and within a year I became a mother and a wife. I thought I was in the home straight of life;- settled, sober and best of all I was secure in the knowledge God loved me. I was content. A few years later life turned bad, really bad. I started praying again, desperately. My faith was tested, I was broken and in a very dark place, I had nothing left in me but to trust God and wait. He showed up in the most mighty, incredible, no words could ever fully describe way! (However helpless a situation feels, God ALWAYS turns it around for good, at his perfect timing). I came out of the most difficult time of my life in absolute awe of how wonderful our Lord is, stunned at the incredible turnaround of my situation, completely forgetting the pain and trouble. His love, his power, his beyond perfect explanations, his wonderfulness overpowered the darkness. He breathed truth into me that exposed every single lie. He showed me an incredible love and attention to detail in my life in ways I couldn’t possibly begin to describe, a love that I definitely did not deserve. The presence of his perfectness instantly exposed the depth of my imperfectness, the destructiveness of my vast sin and, most humbling, was the fact I used to categorise sin but it became perfectly clear that God does not categorise sin the way we do, it’s one category! I am utterly imperfect but incomprehensibly loved. I begged to be wrapped up in this incredible love forever, powerful as thunder and so extremely gentle. I begged God to just take me with him, words that I never thought possible to come from me, a woman with a husband and children who I love so strongly. So I asked “if I can’t come with you now how do I stay close to you?” And suddenly my heart flooded – “JESUS” – and as if someone flicked a switch – I was able to see Jesus. As if an invisible screen had been lifted, I saw where he had been all my life, how he had always been there waiting for me, even through the times I had rejected him and laughed at him, it became crystal clear what he had done for me and I fell head over heels in love with him. What joy! I now understand what peace that surpasses all understanding means and the joy in all circumstances. He really is the light of the world. Jesus never just said “hey I know the way, psst I know the truth, life is over there… ” he said “I AM the way, the truth and the life”. “I AM” ! Something strange also happened – I started to read the bible again but this time I understood it’s meaning. The book that was old and dusty and not easy to understand suddenly became alive and read like the most beautiful love letter. I had been given sharp fresh new ears to hear and eyes to see what God was saying. I finally understood what the guy who wrote “Amazing Grace” was talking about – “I was blind but now I see”! Life became so bright, I never even realised I was in darkness before light came in. I started to see strangers the way God sees them, totally precious and loved beyond measure. My heart became calm, totally content with an abundance of joy, continually being drenched in a constant love that has me singing and dancing and wanting to shout about Jesus from every roof top. He’s Alive!!! He loves you!!!! So much! Now I see that God’s love is not to do with our efforts in being “good”, or practicing religious duties or trying to change ourselves. It is not by our efforts at all. There is absolutely nothing we can do to make God love us any more or any less. No matter how far we run, he is patiently waiting for us to turn back to him. He loves us and has made a way for us in Jesus. We need do nothing else, absolutely nothing else, but trust in him. I was thinking about someone I had forgiven a long time ago. This forgiveness covered a huge hurt. As I was thinking about them, I saw that in forgiving them I was able to see beyond the pain caused. I was able to see the person. Just the person and I felt such love for them. I started to feel pretty happy with myself that I had been able to forgive such deep pain and then suddenly the tables turned – what about me? And who were the people who I needed forgiveness from? Pride immediately welled up in me as I told myself I didn’t need anyone to forgive me because I hadn’t done anything *that* bad! And then I thought back over my life and the floodgates opened; I had said, thought and done things that caused hurt, tears and sleepless nights. My choices with words and actions had caused countless people pain. I was sat thinking about one person I had forgiven but I hadn’t given any thought to the numerous people that I had hurt. I hadn’t given any thought to it because my pride blinded me to it. As I ‘sat down’ to take all this in, I found I ‘was seated’ right next to the person I had forgiven. 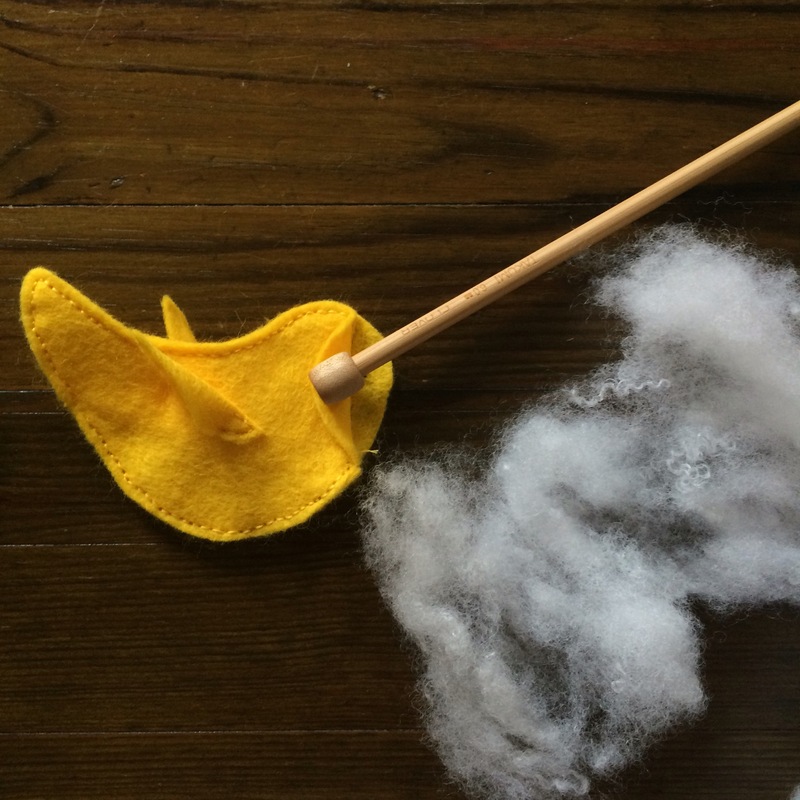 We were in the same boat – two imperfect people who had caused hurt. To give the words “I forgive you, I love you” is wonderful but to receive the words “I forgive you, I love you” is even more so. Every single day I am absolutely floored by what Jesus did for me, for us all, at the cross. Floored that he took a sin filled, rotten to the core woman like me, took the punishment that was mine and defeated death to give us LIFE with him forever. A totally undeserved free gift. We have such a good God. 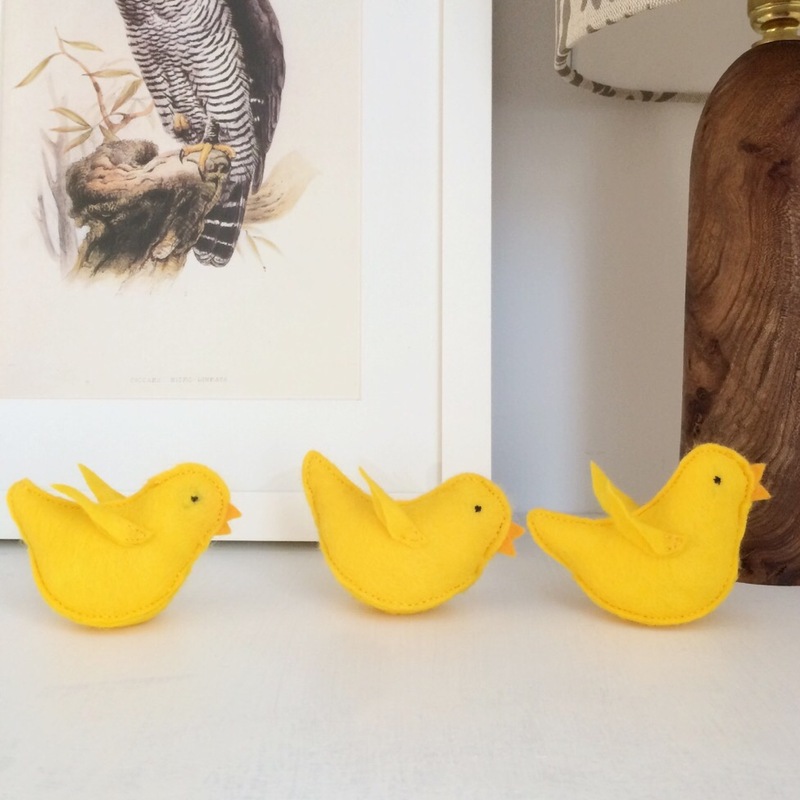 This little chick makes a lovely gift or looks great dotted around the house for Easter celebrations. 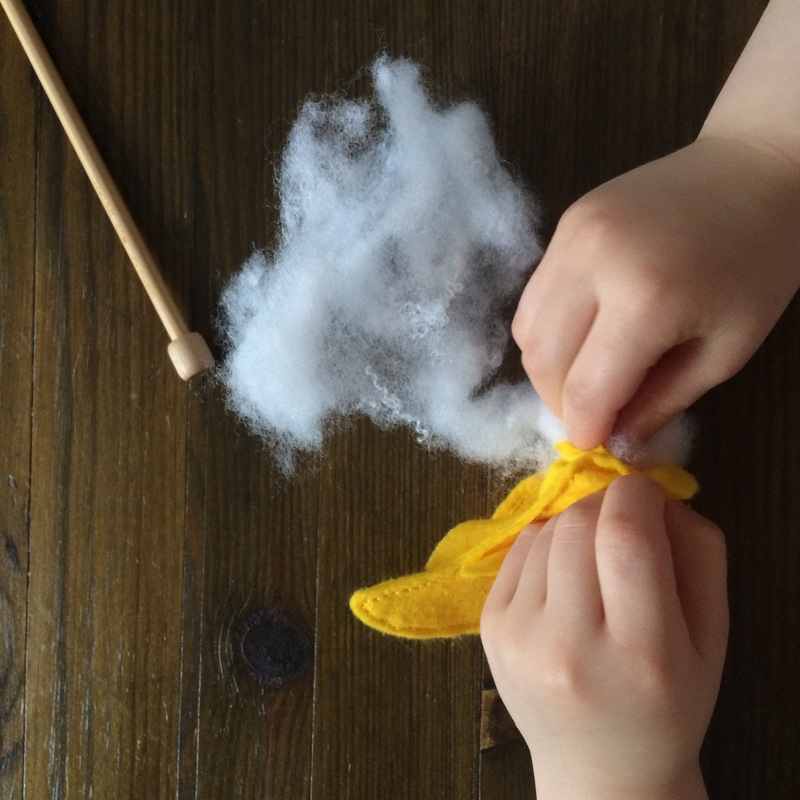 A looped ribbon can be easily added to make a hanging decoration or a rattle insert can be put in. 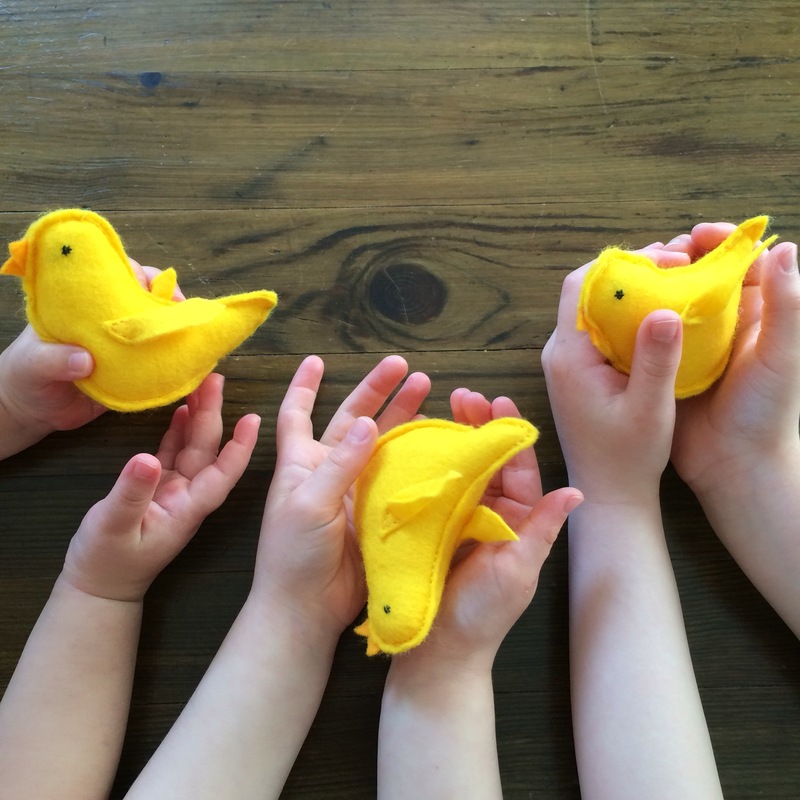 Multiple chicks with loops can be attached to a length of cord which will make a pretty garland for a nursery or can be used to make a sweet mobile to hang above a crib. First draw out your pattern. I would have done a downloadable one, if only I knew how to set that up! Anyway this way you get to do it all from scratch which is great because you can adjust and create patterns for different animals for future projects. 2. 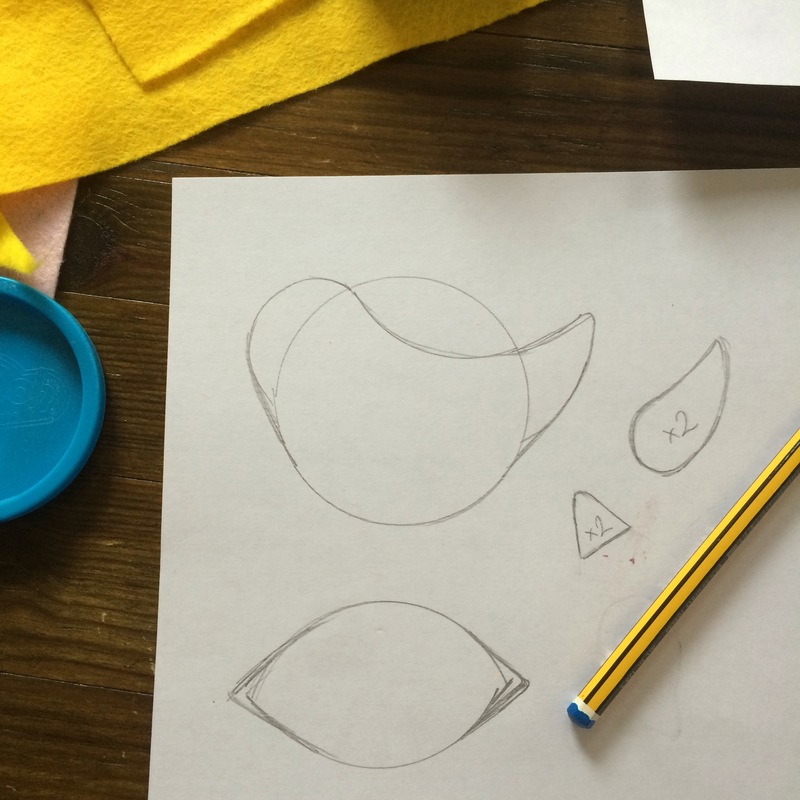 Use scissor handle to draw head shape. Then draw ‘shark fin’ shape on right for the tail. 3. Use the circular object to draw from back of head to tail. Round off the bottom of head and tail. 5. Use the top of circular object to draw top part of a semi circle. 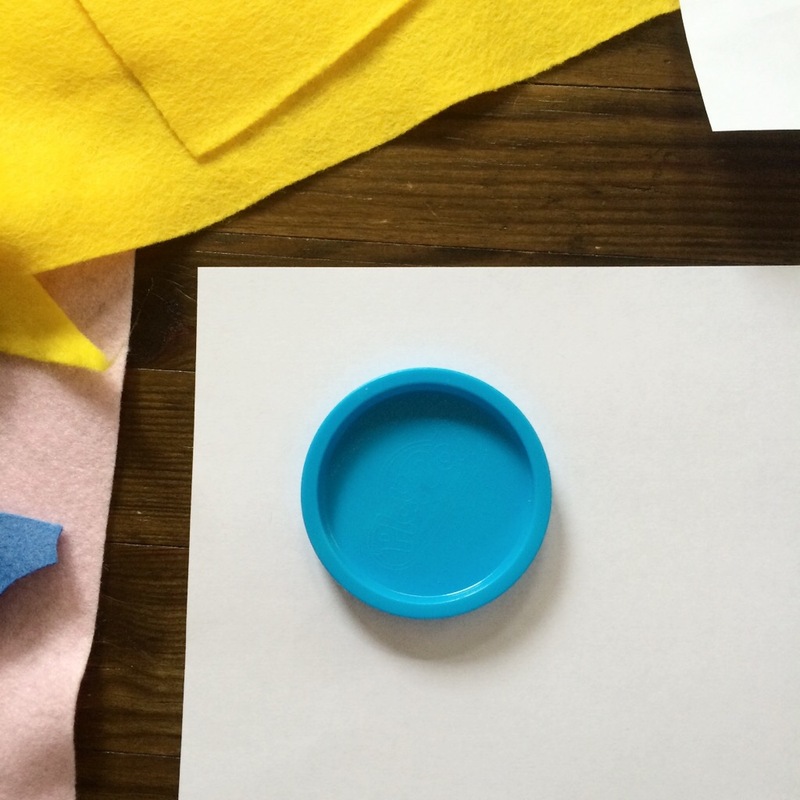 Do the same on opposite side to create an oval that 7.5cm wide and 4cm high. 6. 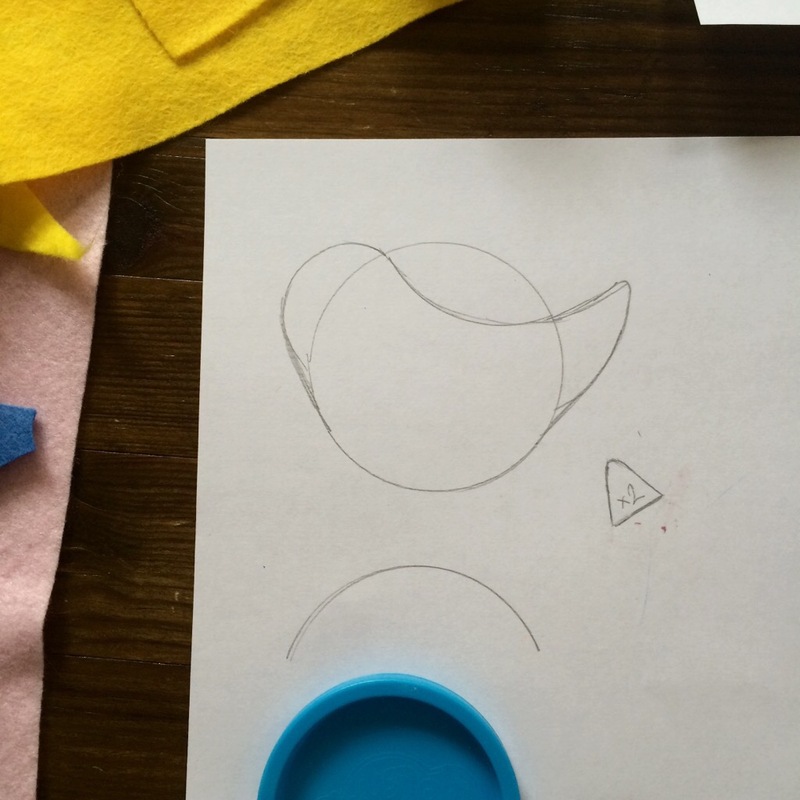 Draw points at the sides of the oval (shown above) taking the shape to 8.5cm wide. It should look a lemon or an eye. 7. 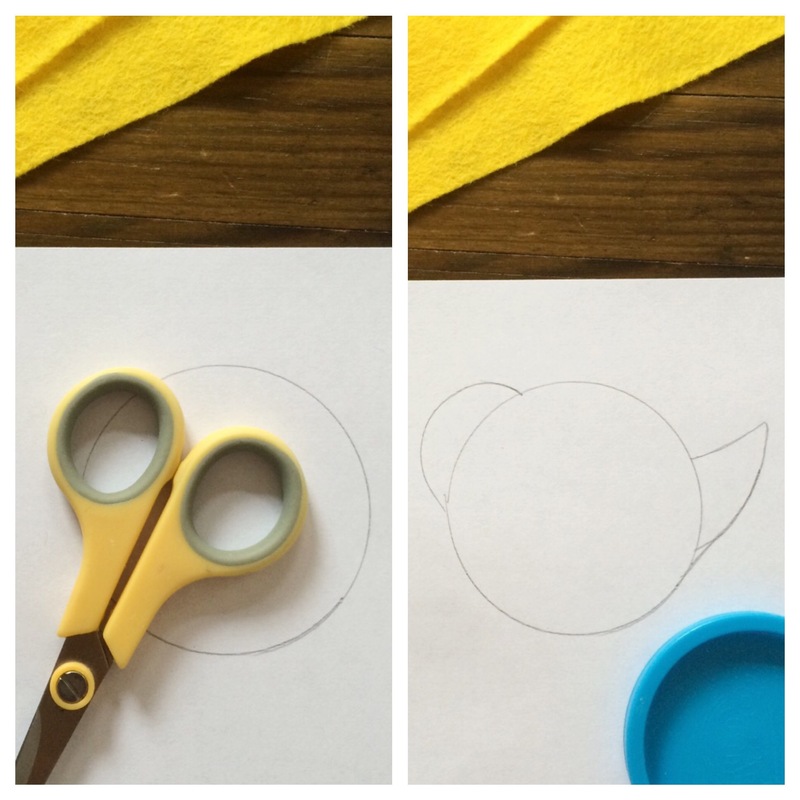 Draw a shape the same as the tail (you can trace it from the tail). Round it off to create the wing. It should be 4cm long and 2cm at the widest part. 9. 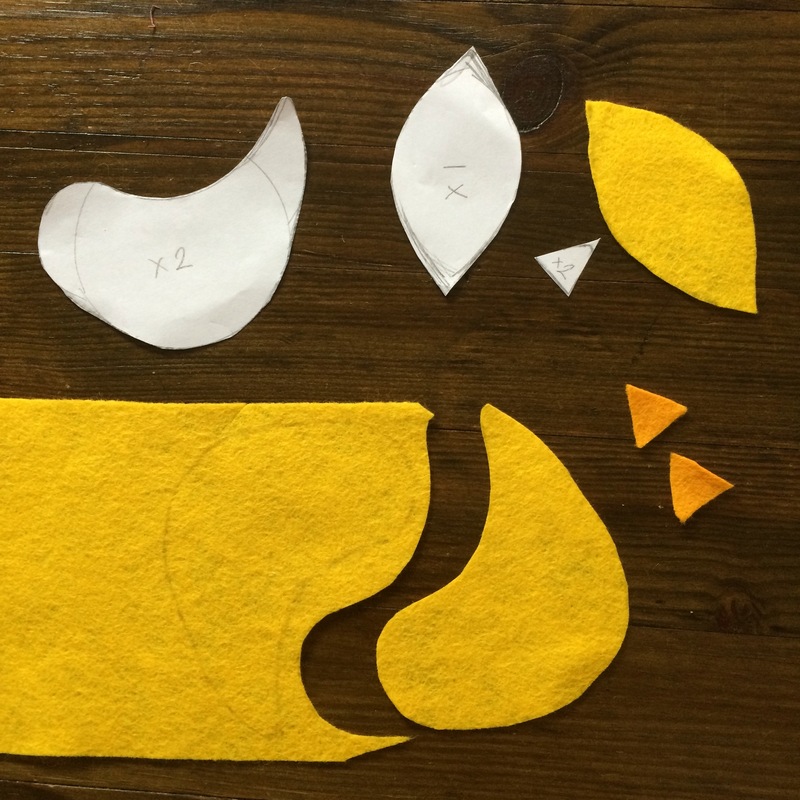 Cut the shapes from felt. Orange for the beak. Everything else yellow. 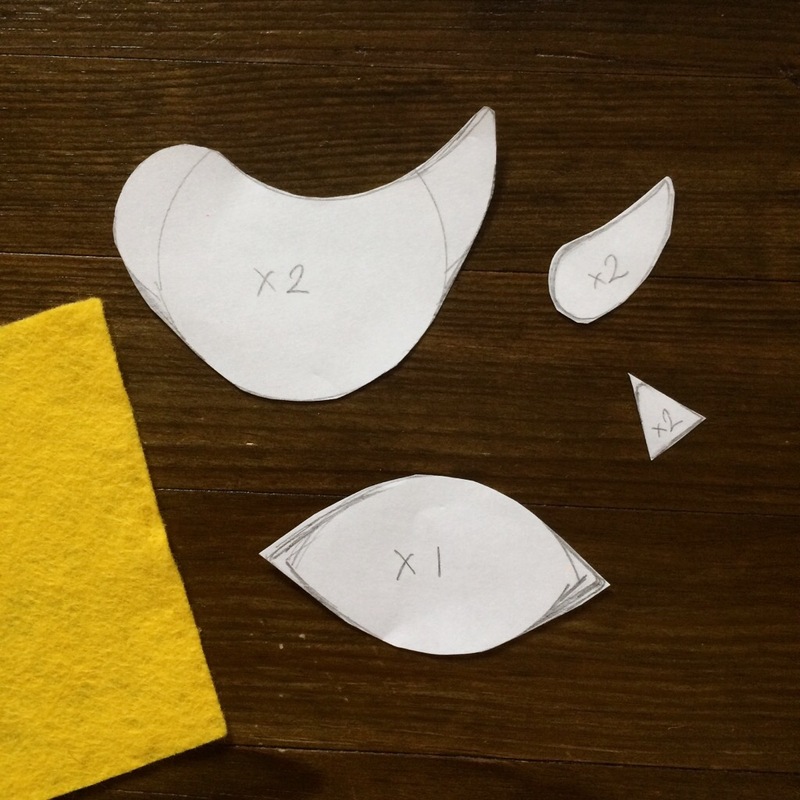 Also cut two pieces of all but the ‘lemon’ shape for which you’ll only need 1 piece. 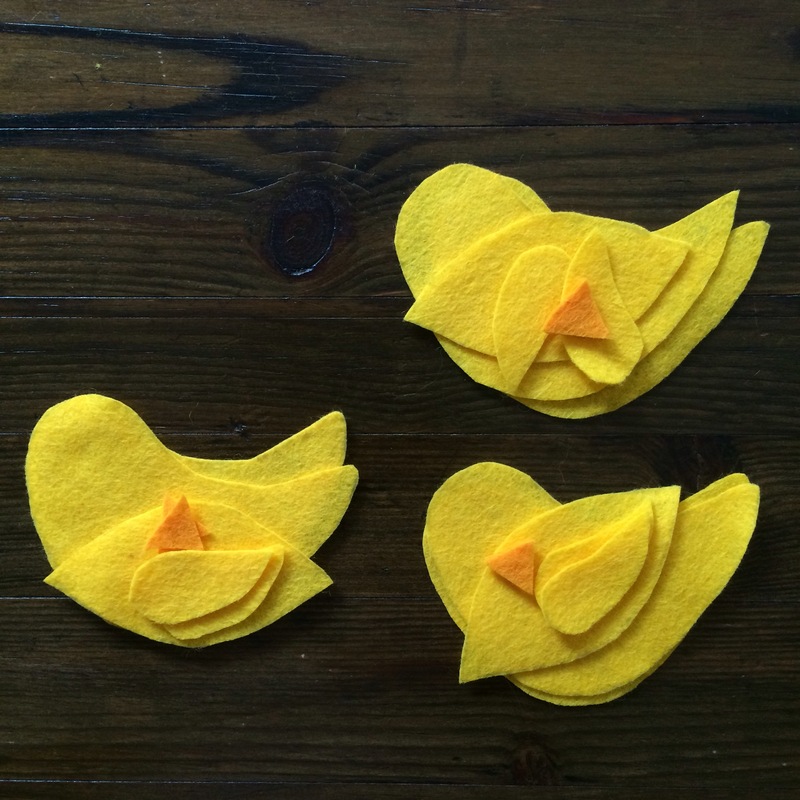 I made three chicks and find it easier to cut all at once. 10. Mark with pencil where the eye will be stitched then stitch using black cotton. I did 4 stitches, two crosses that made a small 8 point star. 11. Fold the widest part of the wing and hand stitch in place. Repeat with the opposite piece. 12. 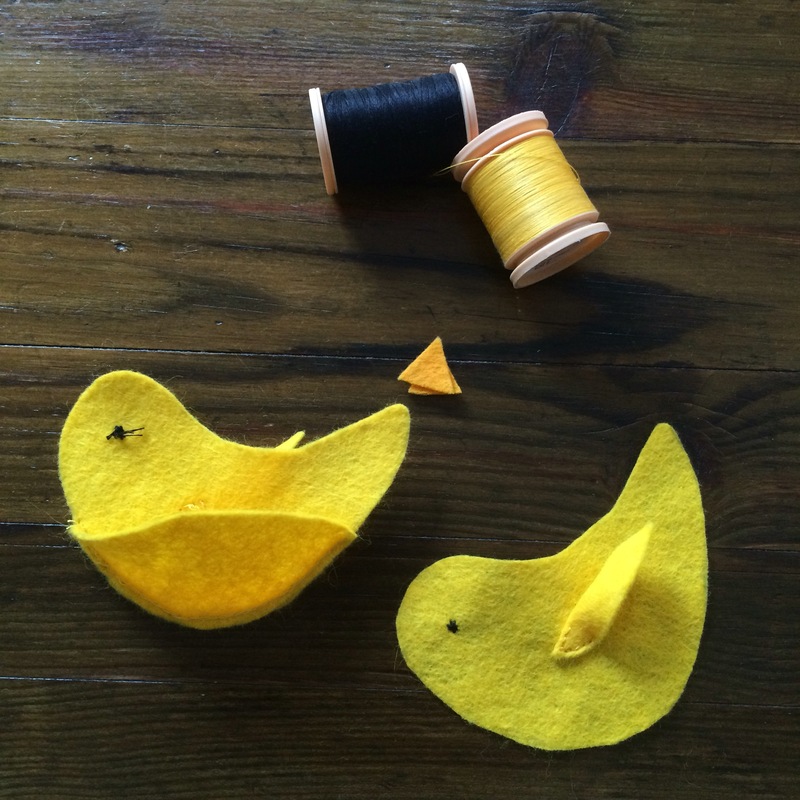 Stitch the ‘lemon’ shape piece to the bottom side of chick with the seam exposed. 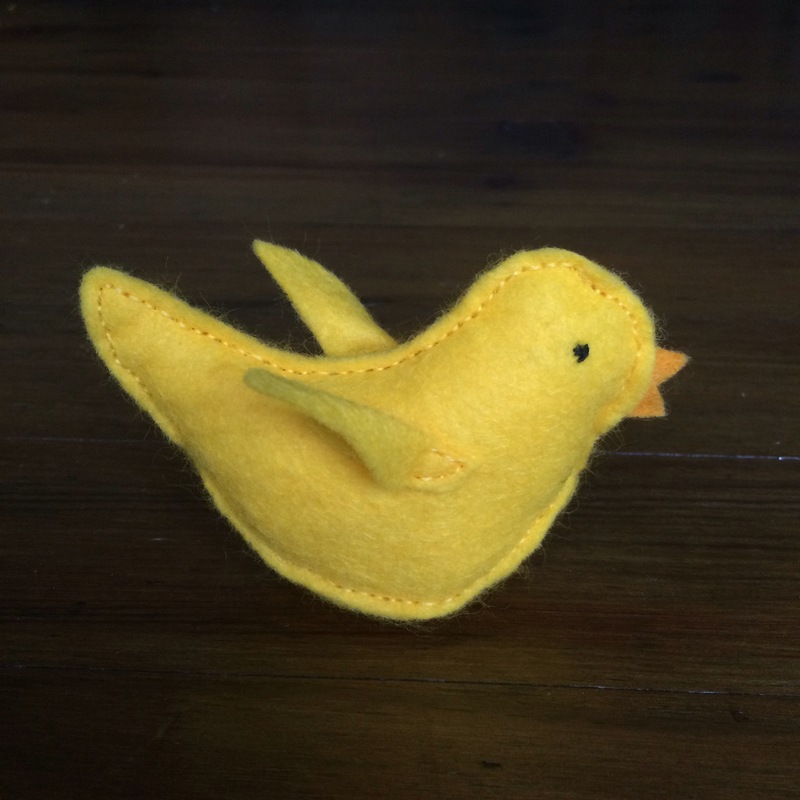 I chose to hand stitch with a back stitch. 15. 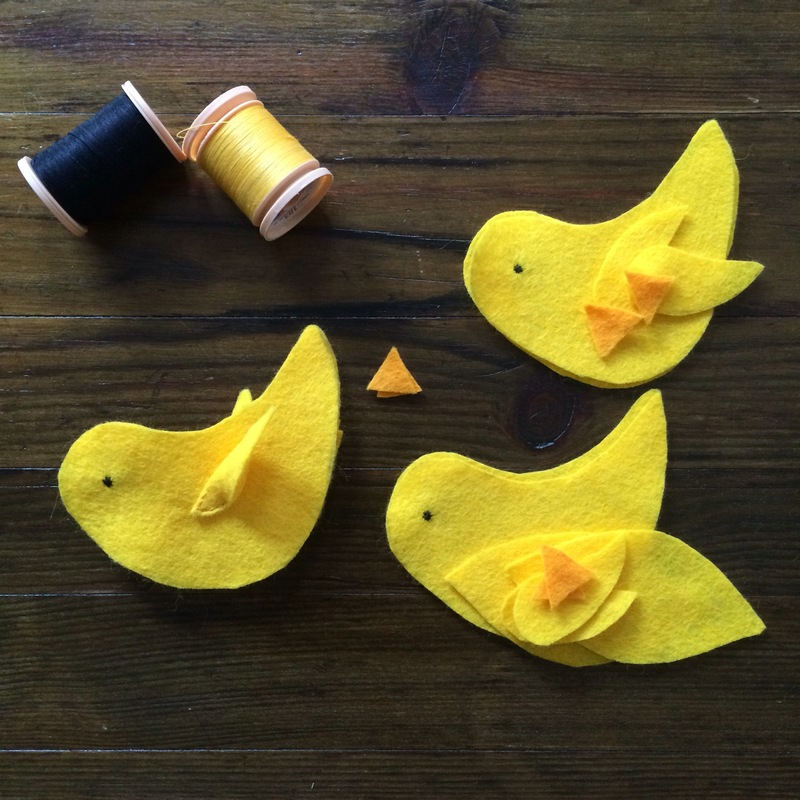 When it is just about full, stitch in place the beak. Keep filling as you stitch until it is closed. Ours have been named Aleela, Rosie and Bill. 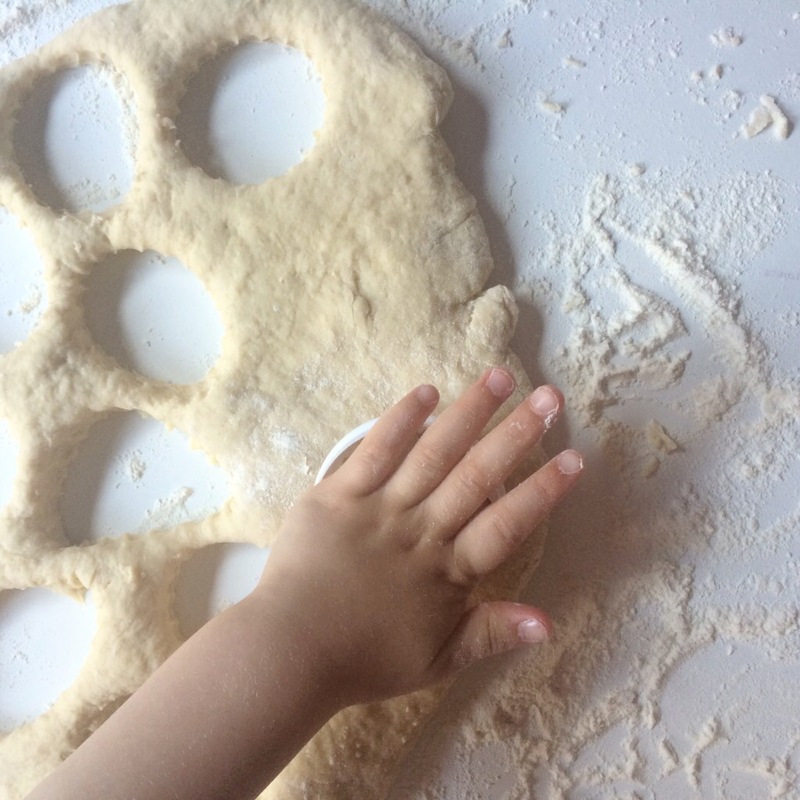 A fun little project that the children can be involved and enjoy playing with. There’s not much that’s better than a hot cup of tea and a couple of scones. 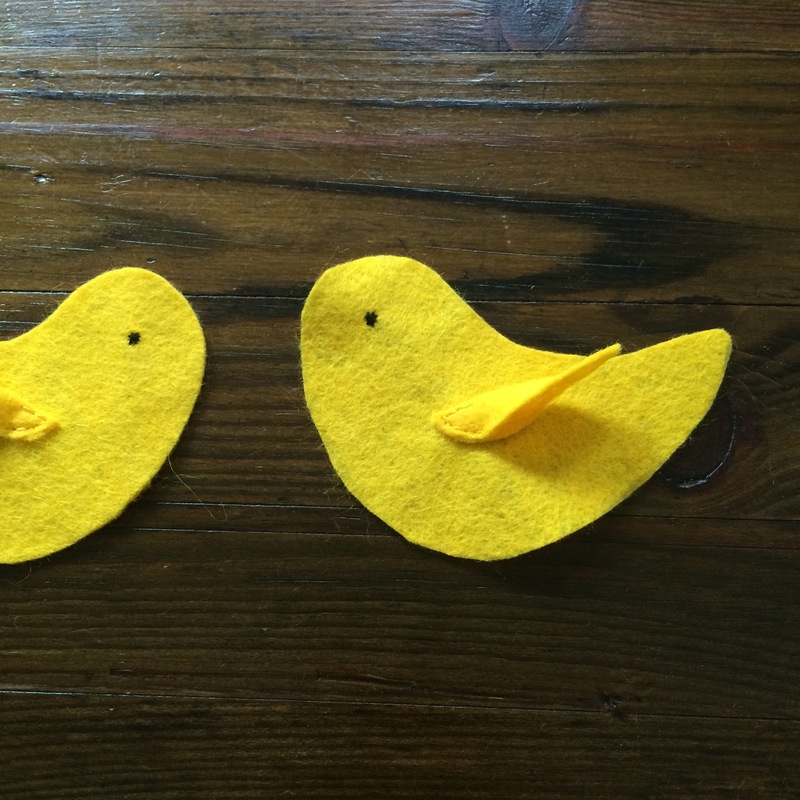 They are really easy to make with the children. 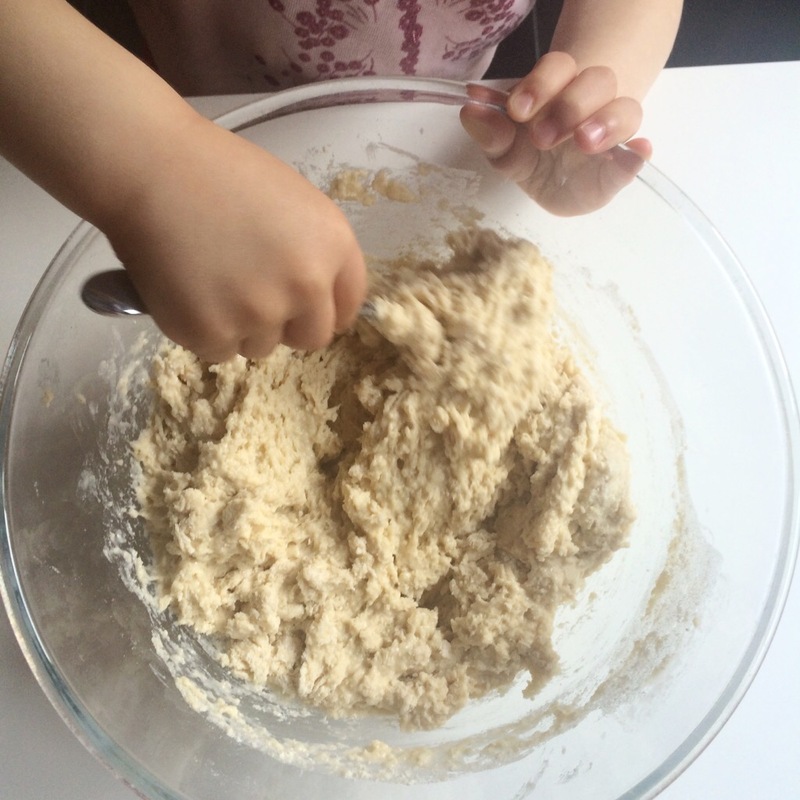 Rub butter and flour with hands till a fine crumble mix forms. Stir in sugar and baking powder. Whisk the egg, milk and vanilla. Save two tablespoons of mixture for glazing. 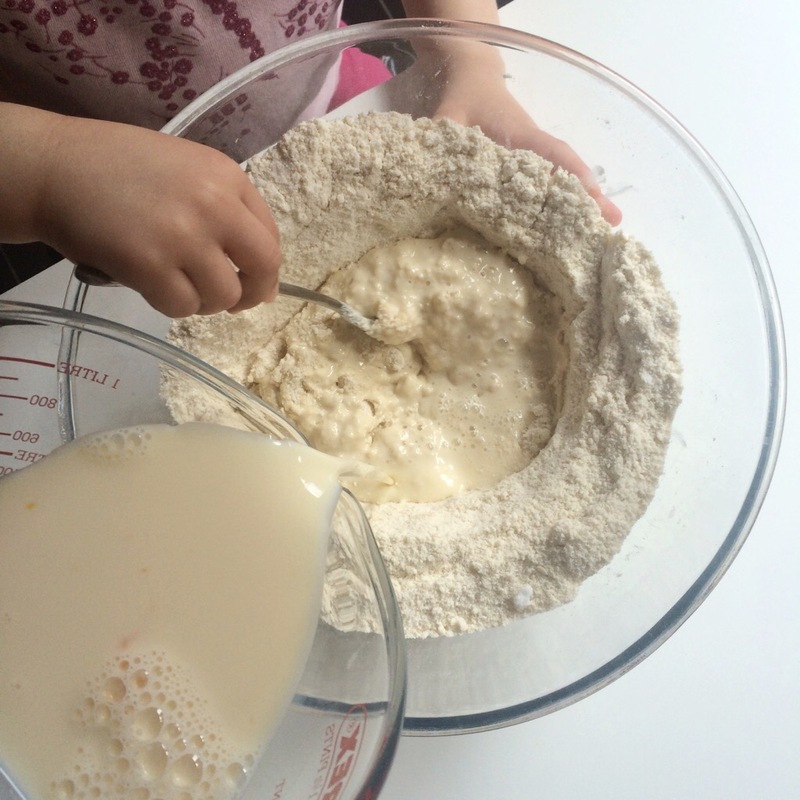 Make a well in flour and slowly add milk mixture, stirring with fork. 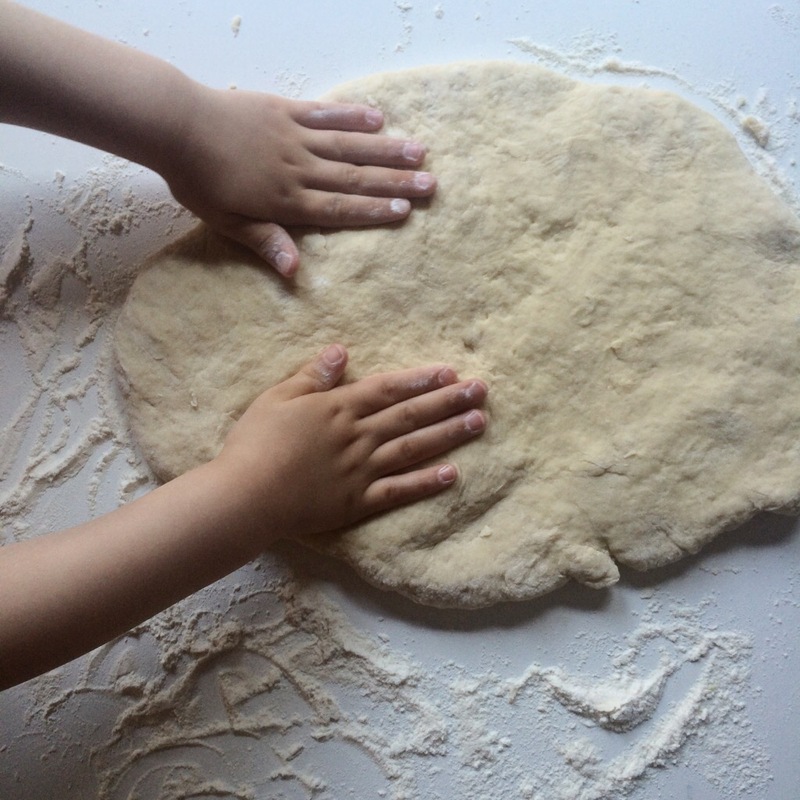 As a dough forms, gently knead. 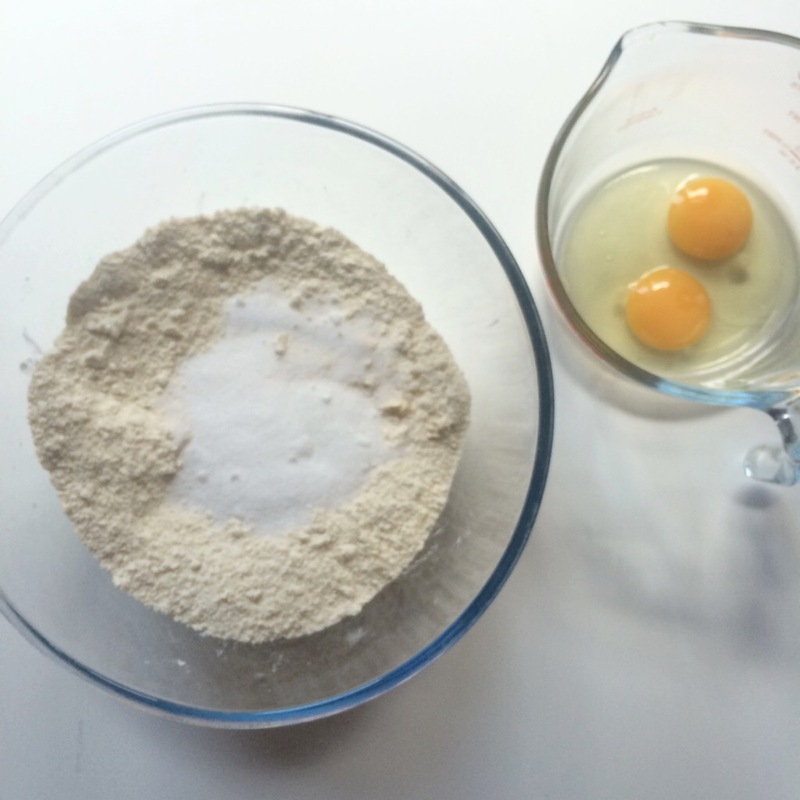 Sprinkle flour onto surface and pat down to 2.5 cm thick. Cut as many scones as possible then re knead and repeat with left over dough. 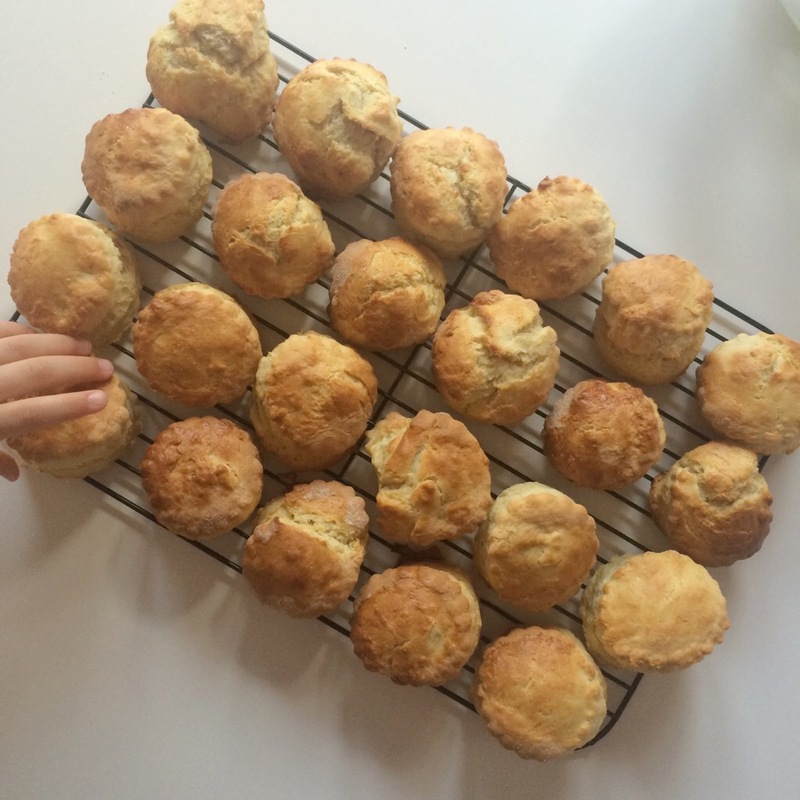 Using a 68mm/70mm cutter will make approx 15 scones. 5cm cutter will do approx 20. Place onto a greased baking tray and brush with saved milk mixture. Bake for 12-15 minutes until golden. Cool on wire rack. 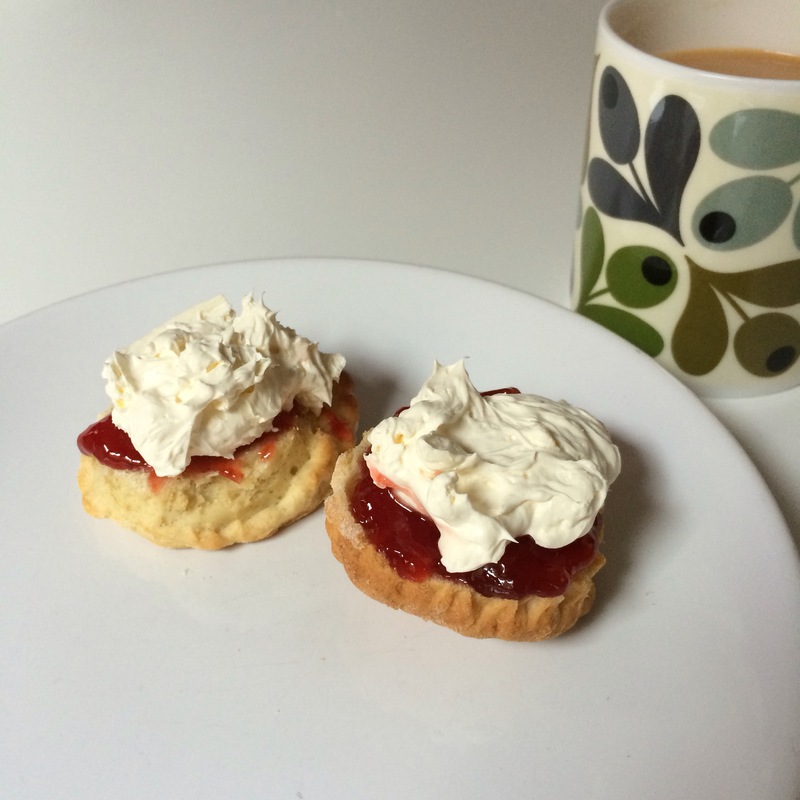 Serve warm with butter, strawberry jam and a good dollop of clotted cream.